President David Granger addressing the opening of the 2018 Police Officers’ Conference. President David Granger on Thursday said former Prime Minister, Samuel Hinds’ talk of the formation of a covert “counter-force” to fight heavily armed criminals has raised several questions, and that the several planned Commissions of Inquiry into massacres are aimed at improving the force’s operations. 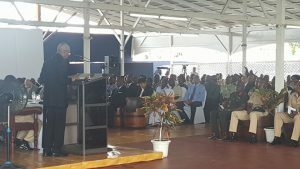 “Numerous questions arise from these careless remarks: who comprised, who commanded, who controlled that counter-force,” Granger said in his address to the opening of the 2018 Police Officers’ Conference. Hinds, also a former President, has said that two counter-forces had been established during efforts to destabilise the then People’s Progressive Party Civic-led administration when the security forces had failed to arrest perpetrators. In his address at the Police Officers’ Conference, the Guyanese leader acknowledged that the police force failed to crush the criminal violence in the 2002-2008 period of the “troubles” but said that was partly due to role of drug lords and rouge members of the Guyana Police Force. “The inability of the police force to curtail the criminal violence led to the emergence of counter-forces and death squads. It revealed complicity between rogue elements in the security services and the drug lords. It exposed the infiltration of rogue elements into the force. It rendered the security forces vulnerable and exposed some of its vulnerable members to unwarranted death,” said Granger, a retired Brigadier of the Guyana Defence Force (GDF). Before drug lord, Shaheed ‘Roger’ Khan had been arrested in Suriname and later convicted in the United States for cocaine trafficking, he had openly taken credit for preventing the Bharrat Jagdeo-led administration from being toppled. Evidence also led in a United States court had shown that then Health Minister, Dr. Leslie Ramsammy had played a role in procuring high-tech phone-tapping and location equipment like what had been found in possession of Khan and his cohorts at Good Hope, East Coast Demerara. The company has said that government authorisation is required before such equipment is sold. He announced that in addition to the Lindo Creek massacre, now currently the subject of a Commission of Inquiry, “in due course” there would be inquiries into, among other massacres, one that snuffed out the lives of then Agriculture Minister, Satyadeow Sawh and his siblings at La Bonne Intention in April 2006. Others on the President’s radar for inquiries are one those in 2002 at Kitty, Lamaha Gardens and Bourda; Buxton-Friendship in 2003; Prashad Nagar in 2003; Agricola-Eccles in February 2006; Bagotstown-Eccles in 2006; Blackbush Polder in August 2006; Lusignan in June 2008 , Bartica in February, 2008 and Lindo Creek in 2008. The President assured that the Commissions of Inquiry are not aimed at breaking the spirit of that law enforcement agency. “The inquiry into the Lindo Creek massacre and inquiries which eventually will be commissioned are intended to improve the force’s operation and administration. They are not intended to demoralise or destabilise the force,” he said. Granger further reasoned that surges of corruption of the security forces, communal violence, execution killings and the failure to eradicate drug trafficking. “The authorities, at that time, instead of trying to cure the cause were more concerned with concealing the symptoms,” he said. The President said the causes of violence must be uncovered to ensure there is no repeat and that there is human safety.